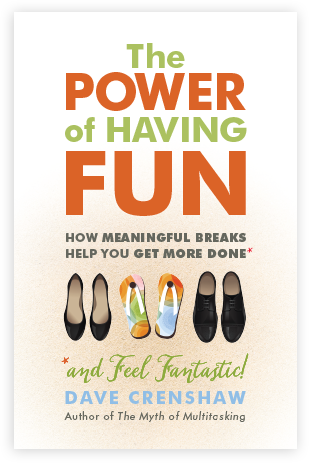 The Power Of Having Fun – How Meaningful Breaks Help You Get More Done—and Feel Fantastic! Fun is something you have to earn, right? You work hard, and then maybe once a year you get to enjoy yourself on a vacation. And after a lifetime of this, you retire and finally do what you want. Dynamic speaker and consultant Dave Crenshaw calls this the culture of WISH: you slave away, believing it will be Worth It Someday, Hopefully. And it’s all wrong. Crenshaw shows that by putting fun first—carefully scheduling enjoyable, meaningful, and refreshing breaks throughout your day, week, month, and year—not only will you be happier, you’ll be a lot more productive too. Fun has the power to turn your life into a WIN—what you do will feel like it’s Worth It Now. With interactive exercises, effective demonstrations, fun graphics, and plenty of wit, Crenshaw details a five-stage process that has helped thousands of people prioritize their personal “Oases”—specific actions and activities that they find renewing and energizing. Readers will be delighted to find a book that lowers their stress, raises their results, and restores recess to their routine! Dave Crenshaw is leading the charge in the field of productive leadership. You may have heard about him from his appearances in Time Magazine, USA Today, FastCompany, and the BBC News. His courses on LinkedIn Learning have received millions of views. Dave is the accomplished author of three books, including the bestselling The Myth of Multitasking. Dave’s forth book, The Power of Having Fun, is scheduled for release in September 2017. As an author, speaker, coach, and online instructor, Dave has transformed hundreds of thousands of business leaders worldwide. You might be next!